Fiber Optic Testers accelerate inspection/certification/diagnosis. Delivering pass/fail certification per IEC 61300-3-35 standard in 2 sec or less, FI-7000 incorporates analysis software to highlight detected damage/defects. Singlemode MultiFiber Pro automatically detects singlemode (1310 or 1550 nm) and multimode (850 nm) wavelengths and accelerates accurate certification of MPO cabling via 20 sec test time. SmartLoop OTDR tests 2 separate fiber links in one test, eliminating need to travel to far end of connection to perform tests and reducing testing time. EVERETT, Wash. -- Fluke Networks today unveiled three new solutions for its family of cabling certification and testing solutions for the data communications and cabling market. Dubbed "Accelerator" solutions, the FI-7000 FiberInspector Pro, Singlemode MultiFiber Pro, and SmartLoop OTDR speed fiber test, inspection, and certification within data center, datacom installation, and large enterprise operations--in most cases, slashing the time to complete fiber jobs by more than 50 percent. "Fiber is the future for data centers and larger enterprises. Organizations increasingly need more fiber cables to keep pace with technologies that demand greater processing power and bandwidth," said Jason Wilbur, vice president and general manager of the Datacom Cabling Installation business unit at Fluke Networks. "Time is money in these environments. The right cable testing solutions can reduce truck rolls, eliminate process steps and dramatically shorten the time required on the job site. We believe our new solutions will do exactly that for our customers." Instead of relying on subjective assessment of fiber end-faces, which takes more time and is less accurate, the FI-7000 FiberInspector Pro delivers pass/fail certification in two seconds or less. The FI-7000 inspects the fiber connector's end-face, analyzing the fiber core, cladding, adhesive layer, and contact surface for damage and defects before generating a pass/fail designation per the IEC 61300-3-35 standard. "A fiber network failure or latent problems can cost millions to a large data center or enterprise, to say nothing of the time and effort wasted on finger pointing and subjective, manual inspection," Wilbur continued. "The FI-7000 takes the guesswork out of fiber end-face testing while cutting inspection time to two seconds or less. What's more, it leverages our powerful Versiv Cabling Certification platform, increasing the overall value to our customers." Existing Versiv FiberInspector owners can take advantage of the FI-7000's analysis capabilities with a simple firmware update. MultiFiber Pro automatically detects the most common singlemode (1310 nm or 1550 nm) and multimode (850 nm) wavelengths. The device's unique non-contact large area input port accepts both UPC and APC connectors. Bi-directional fiber testing has traditionally been a lengthy process, requiring traveling some distance to the far end of the fiber or taking equipment into hazardous or difficult-to-access areas. The SmartLoop OTDR is the industry's first product to test two separate fiber links in a single test. Not only does this eliminate the need to travel to the far end of the connection to perform tests, it also cuts network testing time by 50 percent. 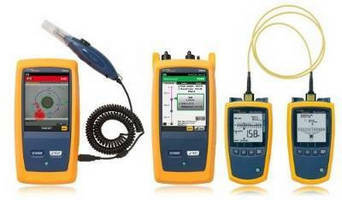 To learn more about Fluke Networks Cable Certification testers, please visit FlukeNetworks.com. For additional information, promotions and updates, follow Fluke Networks on Twitter @FlukeNetDCI, on Facebook, or on the LinkedIn Company or Group page.